Not all golf Umbrellas are created equal. tagUmbrella™ Concierge Class Golf Umbrellas are built on our industry-leading Weathertech™ frame system that features virtually unbreakable, heavy-duty fiberglass shaft, ribs and stays, and a high density textile canopy for extended service. We ship our best-selling 60" Concierge Golf umbrella (#2088) to client Golf Tournaments all over the U.S., Canada and around the world, from Pebble Beach to Winged Foot AND the 2088 is a 5-star Hospitality Industry favorite for Concierge Services & Guest amenities at premium Hospitality properties, luxury Residential properties & uptown Commercial office towers — from New York City to Honolulu. For Wholesale B2B pricing, ordering assistance and further information please contact our friendly client service team or use our quick web form to Request a Quote and we'll send you a personal custom quote by express email including all the details you need to place an order. Weathertech™ frame can be blown inside-out in a windstorm and righted without damage! Windproof frame design can be blown inside-out in a windstorm and righted without damage! Printable areas: single or multiple canopy panels; tie-band with velcro closure; and with large volume factory orders - fabric sleeve cover; private-label hang tag, clear protective plastic sleeve. Individually packaged in transparent protective sleeve. Currently available in-stock colors for Item #2088: Black, Burgundy (not shown), Dark Brown, Dark Green, Navy Blue, Royal Blue, Orange, Red, Taupe-Grey, White. 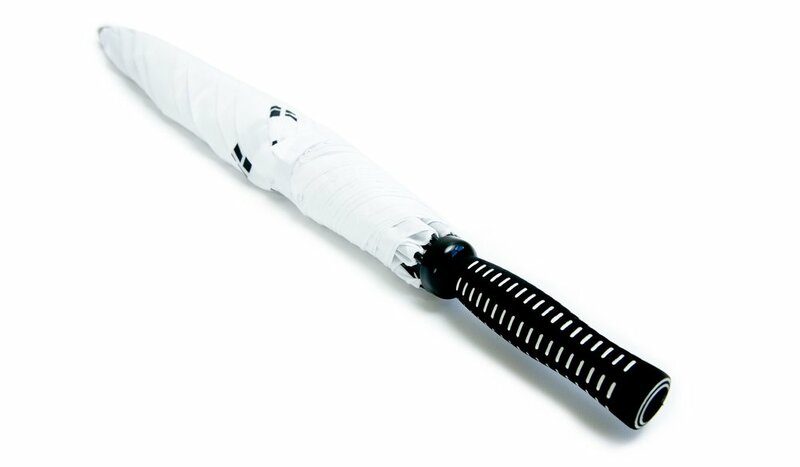 ALSO AVAILABLE WHILE SUPPLIES LAST limited #2088 Golf Umbrella stock, alternating white & solid colors. Please contact TAG Umbrella customer service for up-to-date colors and quantities. Description: tagUmbrella™ Article #2088 - Premium Fiberglass 'Auto-open' Golf Umbrella with extra large 60" Canopy features our trademark Weathertech™ invertible frame system with virtually unbreakable fiberglass shaft, ribs and stays and premium rubber golfer's grip handle for added durability and extended product life. High-density water repellent canopy, logo-imprintable tie-band with velcro closure. Packaging in clear sleeve. 12/inner carton 24/master carton. In the world of custom-printed logo Golf & Concierge Umbrellas, the TAG Golf Umbrella #2088 is a legend. ALMOST AS LEGENDARY as Adam Rolston's 80 day, marathon 20,093-shot charity golf game that ended in September, 2017 on the 18th green of the Mt. Bogd Golf Club in Ulaanbaatar, Mongolia, during which he covered 1,250 miles (2,011 km), playing through swamps, on frozen rivers and across deserts. TAG Umbrella's 30 year marathon began with a mission to build better umbrellas. More than a million umbrellas later we've continually refined the technology behind, and construction of our world famous exclusive #2088 Golf-Concierge Umbrella (and our Executive & Folding umbrella styles) with premium quality commercial-grade components and materials. for Concierge, Doorman, Front Desk & Reception at Residential, Commercial & Hospitality Properties; and first for premium corporate, conference and convention awards and recognition and leading the way for outdoor walking tours. sports team fundraisers, golf pro shops, spectator events & arena team stores, charity & company golf tournament event give-aways, incentives and rewards, and keeping heads dry at varsity stadium events. Read more about our 5-Star Hospitality-Class brand. 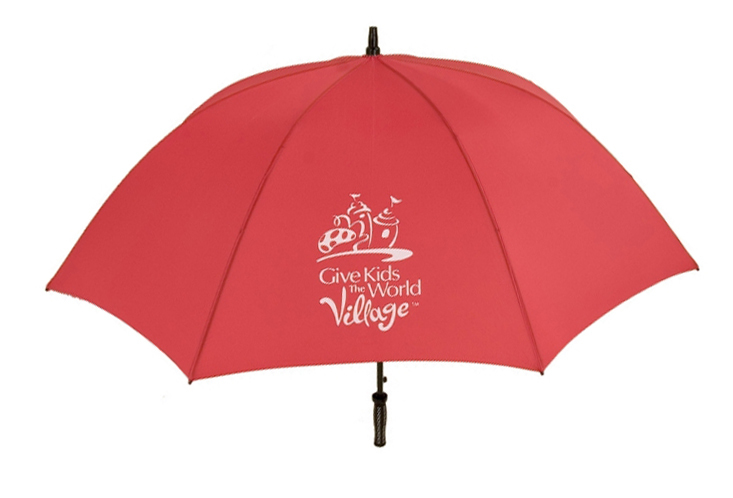 CLICK HERE TO GET-A-QUOTE FOR OUR 'CONCIERGE CLASS' PREMIUM FIBERGLASS GOLF UMBRELLAS... CUSTOM LOGO-PRINTED FOR YOUR BRAND, VENUE, GOLF-TOURNEY, CONCIERGE SERVICE OR EVENT! *Unit pricing shown above (below item image gallery) is based on local printing from local stock; includes a one color logo on one panel and includes screen set-up charge for a one color logo. Additional imprints are charged at $2.50 each and additional screens are charged at $75.00 per color. Delivery and taxes extra as applicable (no taxes charged on US orders). Quantities of 24 to 480 logo-printed golf umbrellas are printed and shipped, usually in a matter of days (outside seasonal peak production periods), from our North American warehouses north of Seattle, WA or Vancouver, BC. For larger volume 480+ orders: wholesale, custom design, white label stocking programs, private-label and custom umbrella fabric colors available with more production lead time than is possible with our in-stock inventory, please read more on our Custom Design Umbrella page, call TAG Umbrella customer service toll-free in North America at 1-800-865-4660 or +1 (604) 913-3390 for International customers or email TAG Umbrella customer service and we will be happy to provide details for custom manufacturing via our express offshore production service. Offshore print production savings: with 'MOQ' (minimum order quantity) for most standard fabric colors of 40 Dozen (480 units) and when lead-time allows, offshore print production services provide substantial costs savings for spot-color screen printing, four-color process and digital custom printing options - check out our Custom Design Umbrellas page for digital printing design samples. Offshore ordering fabric colors: tagUmbrella™ standard fabric colors 'MOQ' 40 Dozen (480 units). Custom Pantone PMS color- match fabric 'MOQ' 120 Dozen (1440 units).